There is something special about your first Alpine pass. The moment you experience the scale of the challenge, dwarfing all those local neighbourhood climbs you once feared. Climbing in dense cloud I was oblivious to the scale of the challenge throughout, as I couldn’t see the summit at any point, but that didn’t detract from the experience. 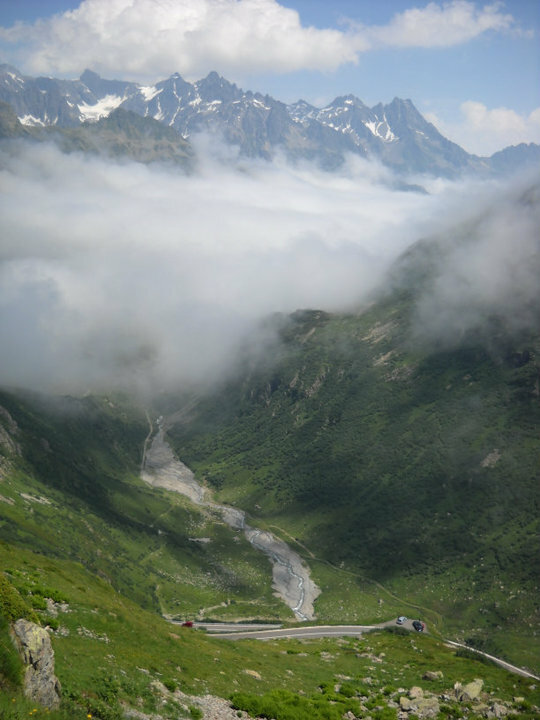 This is the story of my first mountain pass, the Sustenpass in Switzerland, a Hors Catégorie climb (“beyond categorization” or incredibly difficult). I should point out that I knew nothing at all about the climb prior to attempting it, it was just in the way, and going around it didn’t look to be an option. I’d pulled into the campsite at Interlaken at the end of my 5th day cycling. I was in high spirits as I arrived, the scenery was jaw dropping, snow capped peaks filled the southern horizon as I cycled around the turquoise lake in July. In all honesty I was now getting nervous; the diary of my trip to this point could be summarised as: Day 1 = no hills. Day 2 = tiny hills. Day 3 = hills. Day 4= big hills. Day 5 = massive hills. Day 6 = the Alps. Each day I seemed to say “biggest hills of the trip so far” and on day 5 I though I had actually hit the Alps already. Riding the actual Alps was clearly going to be a steep learning curve (pun intended). I saw the jagged and snow covered peaks, I knew they were going to be the biggest obstacle I would tackle on my European coast to coast trip (Dover/Calais to Venice). I had never ridden an Alp before and I had been dreading this part of the trip, the crux. I was fully loaded with panniers and camping kit adding approximately 12 to 13kg of excess weight to drag up there. Is this even going to be possible for me? I started to panic and looked for some reassurance by chatting to some locals. 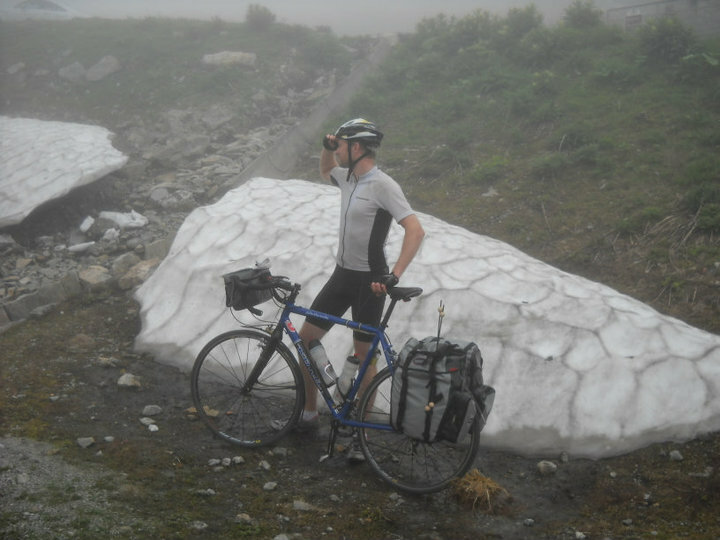 A word of warning, if you’re looking for advice about cycling up a mountain or two and you ask people who definitely do not cycle up mountains (e.g. plump middle aged women in gift shops) their advice will mostly be: “I would not cycle that way, it’s very hard. Or that way! It is also very hard. 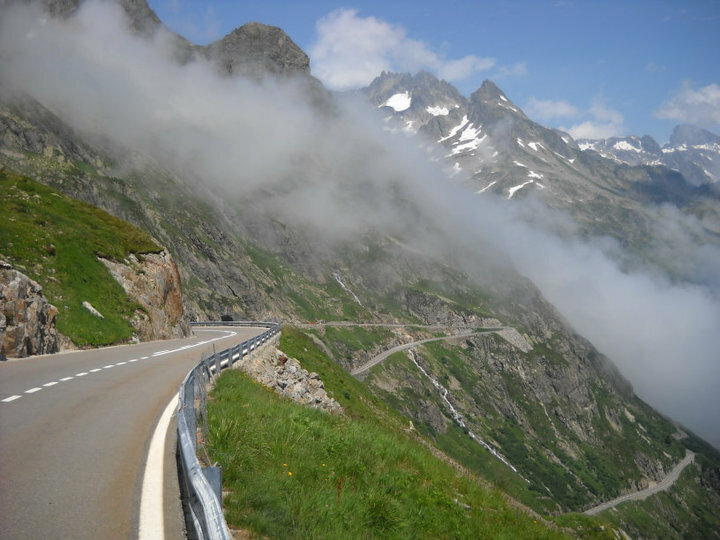 All the ways you are suggesting are mountains you idiot, head back the way you came!” So after much pointless discussion I decided that the best way for me to get into Italy would be to head over the Sustenpass, then immediately over the impossibly beautiful (and cobbled) road of the Gotthardpass. I set off from Interlaken early on a wet July morning; light drizzle and thick clouds obscured the view of the mountains that loomed ahead. I had about 40km until the start of the first climb, where the road heads up on the outskirts of Innertkirchen. I stopped at a bakery to top up on much needed pastries to fuel the climb ahead. I stuffed the last pastry into my mouth and got started on the climb, my first Alp, how hard can it be? I was about to find out. After a few minutes of climbing the lower slopes I was overtaken by a couple cycling together, I chatted briefly with the women as she overtook me, before they disappeared off up the road. After a few more miles I’d managed to catch up with her again (her partner was aiming for a fast time and had gone ahead) and we ended up cycling the rest of the climb together, chatting (where breathing allowed) the whole way. It was another first for me, first Alp and the first Olympic medallist (silver and bronze for rowing) I’d ever met. I should have noticed the gold Olympic water bottles on her Pinarello, only I was too distracted by the mountain I had to climb. The talking really helped to take my mind off the 28km of climbing up to the 2224m high summit. My Olympic medallist friend had driven the pass the previous day so became my guide, only I didn’t like the answers I was getting. “So we must be half way by now right?” would be followed by laughing and “Are you serious? we’re not even a quarter!”. We rode up through and into the clouds, it was freezing cold and all around I could hear torrents of water hurtling down the mountain. It must be a spectacular view, only all I could see was the thick cloud, giving me just a few meters of visibility. We were both running compact chainsets, so once we were in our lowest gears we had no other choice but to press on at the same pace or grind to a halt. It worked though, we held a steady pace and kept on talking. When the road turned to hairpins the gradient kicked up and I started to struggle. 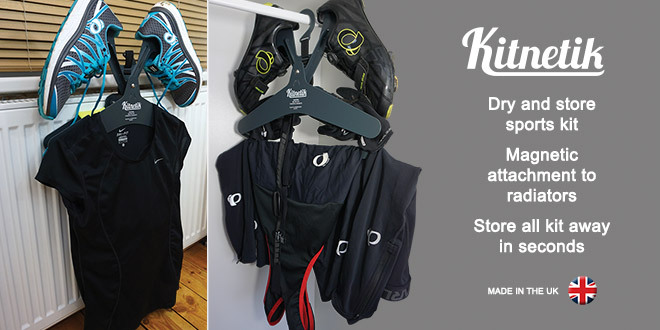 A skinny climber overtook on a lightweight carbon bike and looked at me and my full pannier bags with disbelief, his face was a picture, but I was suffering too much to laugh at this point. I saw snow at the side of the road, and heard voices from somewhere in the clouds/fog, and slowly the lights of a café came into view along with a bus and some motorcyclists. We’ve made it! Oh thank god for that! A man called out from the café to my medal winning friend and she took a photo of me by a pile of snow before I continued on my way towards Italy. I arrive at the bottom and buy some well deserved lunch. 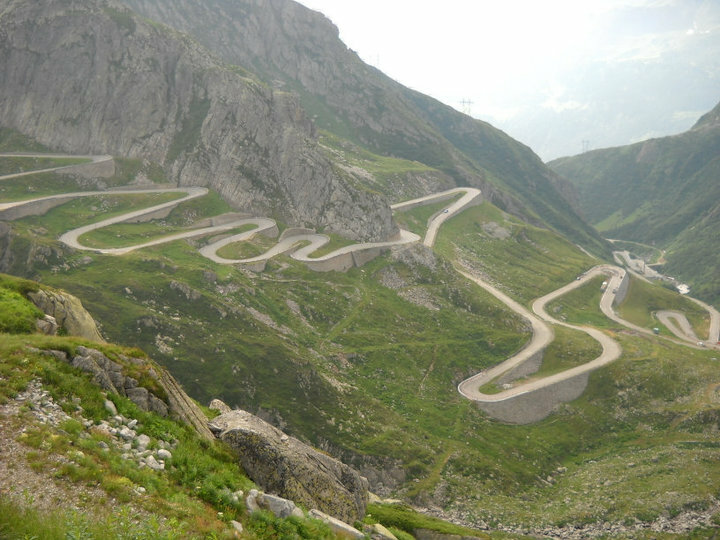 Next stop the Gotthardpass (Passo del San Gottardo) which will take me from German to Italian speaking Switzerland. Another summit over 2000m nicknamed the “Paris Roubaix of the Alps” because of its cobble stone surface. If that last decent is anything to go by these mountain things are great fun and totally worth the effort. Bring on the cobbles! Perhaps the views and the feeling of achievement are worth the long slog up there? Or perhaps my memory has a problem recalling pain and discomfort?